This is an award-winning site beside the River Tone, in a pretty part of South Somerset. 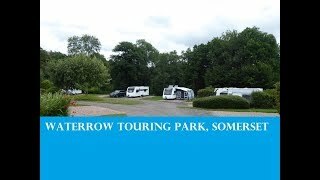 Tony and Anne Taylor have enthusiastically developed Waterrow into a charming, landscaped touring park for adults only. Nestling in a little sheltered valley, it is very peaceful and suitable either for an overnight stop (just over 30 minutes from M5) or ideal as a base for exploring nearby Exmoor and the Brendon Hills. 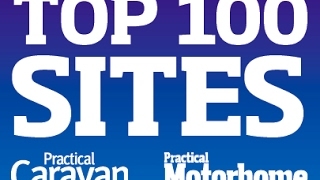 There are 48 touring pitches, most of which are on level hardstandings, including five with full services. All have 16A electricity, spring and mains water are available and TV aerial points have been installed (long leads sold on site). A small area has been set aside for tent campers. A member of the Best of British group. Converted barns have been put to good use, providing local tourist information, a small library and a visual record of the park’s development. Further down the park, below the touring area, wide steps lead to the park’s own nature reserve where, alongside the river, you can find the Otter Holt, go fly-fishing for wild brown trout (tuition available), take a riverside walk or just relax and watch the birds (the swallows can be seen on the site’s CCTV). A modern, clean toilet unit, well fitted out and with heating, provides WCs and washbasins, some in curtained cubicles. Heated shower block. Facilities for disabled visitors (key). Laundry facilities. Motorhome services. Limited provisions are available in reception. Regular watercolour painting and drawing courses are run (May-Oct) at the in-house studio. Additional fly fishing holidays can be arranged at certain times. WiFi (charged). Caravan storage with ‘store and stay’ system. Site is not suitable for large American motorhomes. Max. 2 dogs. Cottage for hire. From M5 exit 25 take A358 (signed Minehead) round Taunton for 4 miles, then at Staplegrove onto B3227 for 11.5 miles to Wiveliscombe, where straight over at lights to Waterrow (still on B3227). Park is on left shortly after the Rock Inn. 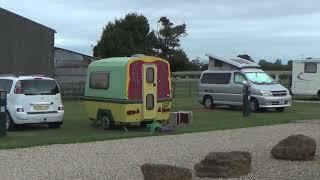 Do not use sat nav for this site as it takes you on roads unsuitable for caravans.